Trevali Mining’s Caribou zinc mine in the Bathurst Mining Camp of New Brunswick. Source: Trevali Mining Corp.
Trevali Mining Corp. [TV-TSX, LMA; TREVF-OTCQX; 4T1-Frankfurt] on Thursday January 17 announced a leadership change, along with weaker-than-expected production guidance for 2019. The company said CEO Mark Cruise and Chairman Mike Hoffman both plan to step down as part of a leadership transition. A search for their successors is now underway. Trevali is a zinc-focused, base metals mining company. It operates the wholly-owned Santander mine in Peru, the wholly-owned Caribou mine in the Bathurst Mining Camp of northern New Brunswick, the Rosh Pinah mine in Namibia and its 90%-owned Perkoa mine in Burkina Faso. Trevali bought the Rosh Pinah and Perkoa mines, in addition to a basket of other assets, from Swiss metals trading giant Glencore PLc. The US$417.86 million acquisition was completed in August, 2017. Trevali produced 103 million pounds of payable zinc in the fourth quarter, bringing production for 2018 to 407 million pounds. That was at the low end of the company’s guidance of between 400 million and 427 million pounds. However, the company is guiding investors to expect zinc production of between 361 million and 401 million pounds in 2019. The weaker than expected guidance is based on lowered grade expectations at both Rosh Pinah and Perkoa. Cash cost guidance of US$0.81 to US$0.88 a pound is also above street estimates. Scotiabank, for example, was anticipating 2019 cash costs of US$0.73 a pound. Trevali shares declined on the news, falling 8.97% or $0.035 to 35.5 cents on volume of 6.25 million. The 52-week range is $1.69 and 33.5 cents. In 2018, Trevali produced 41.7 million pounds of lead and 1.2 million ounces of silver. 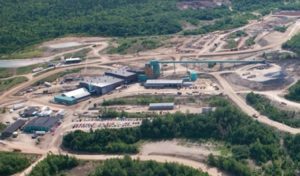 The Vancouver company recently downgraded the production guidance for its Caribou mine in New Brunswick due to challenging rock mass conditions. In a press release, Trevali said that as part of an ongoing technical review, several key operational changes were required to ensure the safety of employees, equipment and to maintain production targets in the long term (2019+). This was due to challenging wall rock mass conditions. During early to mid-October, adverse conditions were experienced in two mining zones, resulting in the cessation of retreat mining and the subsequent loss of some production from the remaining 2018 mine plan. The company said management slowed the mining rate in order to accelerate mine development in the fourth quarter of 2018 through the first quarter of 2019 to build more optionality and stability in the mine to deliver safe, strong and reliable results in 2019. As a result, Caribou produced 72 million pounds of payable zinc in 2018, down from an earlier target of 86-90 million pounds. The company said planned remediation work (increased development, ground support and installation of cemented fill in key areas of the mine) remain on track to return it to normal production levels in the second quarter of 2019, the company said.